How does the GitHub Pages Configuration Work? 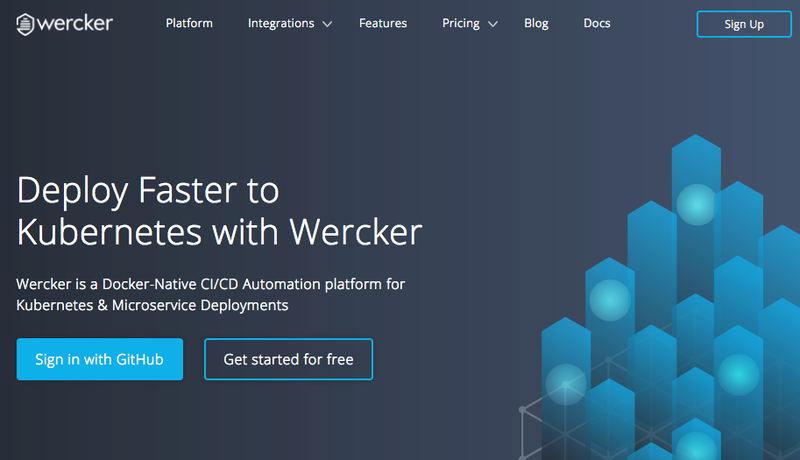 You can use a free tool called Wercker to automate deployments between your GitHub-hosted source and final website on GitHub pages. If you do not meet these assumptions, the GitHub help section has an explanation of how to install and use git. Signing up for a GitHub account is free as well. If you are completely unfamiliar with creating a new Hugo website, visit the Hugo Quick Start. All the work for setting up a Hugo project and using this guide is done via the Hugo CLI’s most basic commands. See the command line reference page for a more exhaustive account of the CLI’s features. We will use the Herring Cove theme by first cloning the theme into the themes directory. The preceding example for the about page leverages archetypes to scaffold a new content file with preconfigured front matter. Find out more about Hugo’s archetypes. Now you can edit contents/about.md in your text editor of choice, but this is not necessary for the purposes of this guide. Running the following command will build your Hugo site into the public directory. If everything is fine, you should see something similar to the image below when you go to http://localhost:1313 in your browser. Adding Git to your project is done by running the git init command from the root directory of your project. Now we need to create a new repository on GitHub. 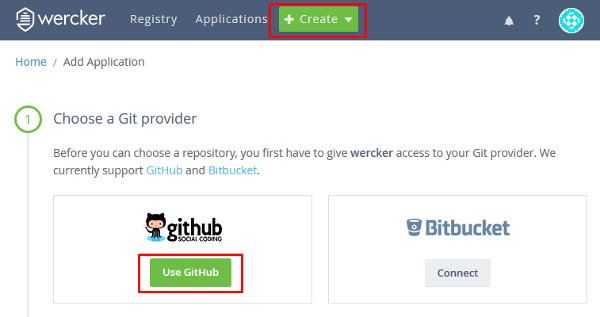 Once you are signed in to GitHub, you can add a new repository by clicking on the +▼ dropdown at the top right or by going to https://github.com/new..
To sign up for a free Wercker account, go to https://www.wercker.com and click the Sign Up button on the top right of the home screen. 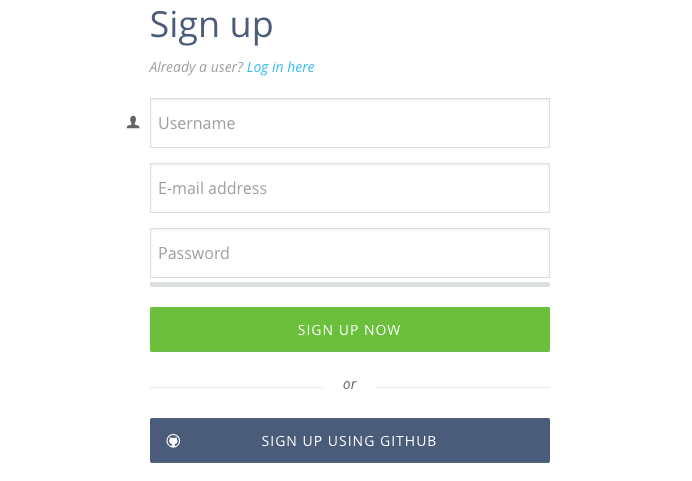 Sign up for Wercker using your GitHub credentials. If you don’t have a GitHub account, or don’t want to use it for your account, you have the option to register with a username and password as well. However, the second half of this guide—devoted to hosting your website on GitHub pages—will no longer be of interest to you. If you registered for Wercker using GitHub, it will most likely look like the following image. 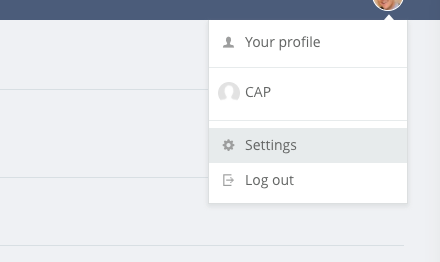 To connect a missing service, click the Connect button, which may send you to either GitHub or Bitbucket to sign into your respective account. Now that we’ve got all the preliminaries out of the way, it’s time to set up our application. For this we click on the + Create button next to Applications and choose GitHub as our provider. When selecting GitHub, Wercker will show all your GitHub repositories. You have the option to filter repositories using the search input at the top of the repositories list. Once you have your repository selected, click the Use selected repo button. 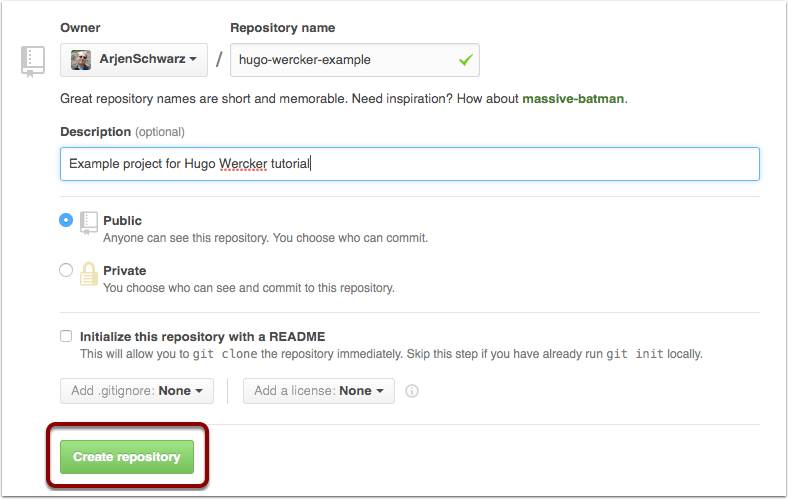 In the next step, Wercker asks you to select the repository owner. Select your GitHub account and continue. This guide assumes you are using a public GitHub repository and understand that the published GitHub Pages website will be available to everyone. This step can be slightly tricky. 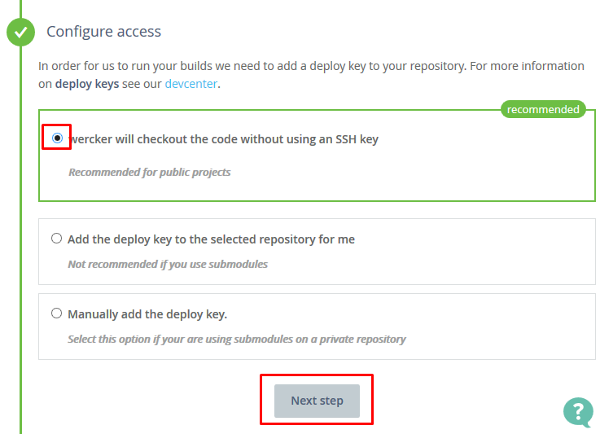 Wercker does not have privileges to check out your private projects by default and therefore needs your permission to add a deploy key to your repository. By selecting the first option, you’re simply allowing Wercker to check out the code via the same methods available to anyone visiting the project on GitHub. Wercker will now attempt to create an initial wercker.yml file for you. More specifically, it will create a code block within the Wercker interface that you can copy to your finished file. Wercker gives us a debian box because our project does not have any special requirements. Now we need to create a wercker.yml file in the root of our project. This file will contain our Wercker app’s configuration. After we finish setting up our app, we will expand the contents of this file to build and deploy our website. This is a personal choice. You can make an app public so that everyone can see more details about it. Keeping it private or public does not provide any overt benefits for you as the creator of the app. That said, the app we are currently creating has been made public to facilitate easier usage of this hosting and deployment guide. The application is now added and Wercker will offer you the chance to trigger a build. However, we will decline the offer because we haven’t yet pushed our wercker.yml file to our GitHub repository. Now we need to add the Wercker steps to our build process. First, we go to the “Registry” action in the top menu. 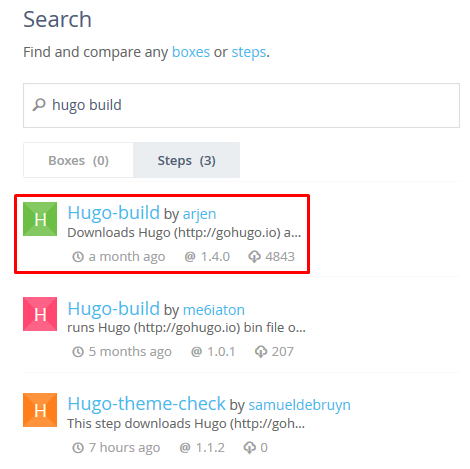 When in the registry, we can search for “hugo build”. 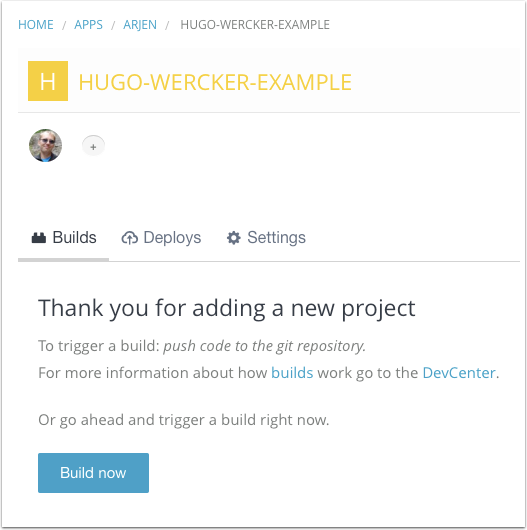 Select the “Hugo-Build by arjen” step. A summary of very basic usage is available at the top of the details for the Hugo-Build step. Below the basic usage is the contents of the README.md file associated with the step’s repository. README.md’s on Wercker usually contain more details about the advanced options and examples of usage. We’re not going to use any of the advanced features of Hugo-Build in this guide. Let’s return to our project and add the first section of details we need to our wercker.yml. The docs are a work in progress. As such, the version represented in this guide may not represent the version you’ve been using for local development. Be sure to use the appropriate Hugo version for your build step. We can conclude this first step by pushing our wercker.yml to our GitHub repository and then seeing the magic at work within Wercker’s interface. git commit -a -m "Add wercker.yml"
If completed and successful, a green check mark should appear in the commit column of your first build. However, this is only the build step. We still need to deploy the website to our free hosting on GitHub Pages. If you would like more details about the build, you can click the commit hash. We’ve provided a some important information in our wercker.yml. First, we’ve added the domain we want to use for our published website. Configuring the domain here will ensure that GitHub Pages is aware of the domain we want to use. Secondly, we’ve configured the basedir to public. This is the directory that will be used as the website on GitHub Pages. public is also the default publishing directory in Hugo. (For more information, see hugo’s configuration docs). Lastly, you’ll notice a $GIT_TOKEN variable. This is used for pushing our changes to GitHub. We will need to configure this token before Wercker can build our website. 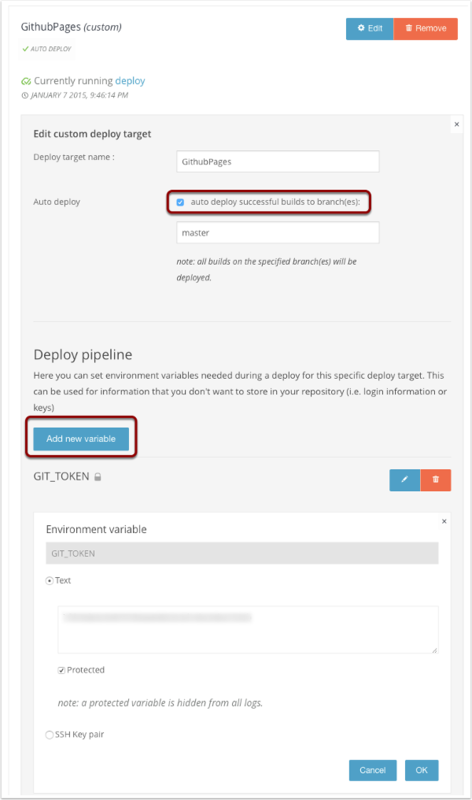 We can set our deploy target by going to our app’s settings and clicking on Deploy targets. Now select Add deploy target and then Custom deploy. The next screen requires you fill in the deploy target name. Make sure you enable auto deploy from the master branch. Add a variable for the GIT_TOKEN. You’ll need to create an access token in GitHub. Follow the directions in GitHub help. 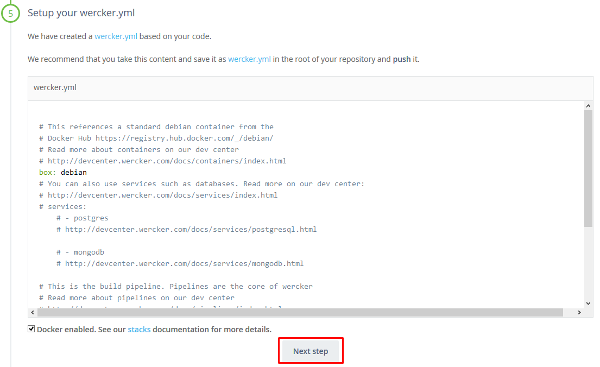 With the deploy step configured in Wercker, we can push the updated wercker.yml file to GitHub and it will create the GitHub pages site for us. The website described in this guide is available at http://hugo-wercker.ig.nore.me. Once this workflow is established, you can update your website automatically by pushing any content changes to your GitHub repository. The source code for the site used in this guide is available on GitHub, as is the Wercker Hugo Build step. If you want to see an example of how you can deploy to S3 instead of GitHub pages, check Wercker’s documentation for guidance on setup.